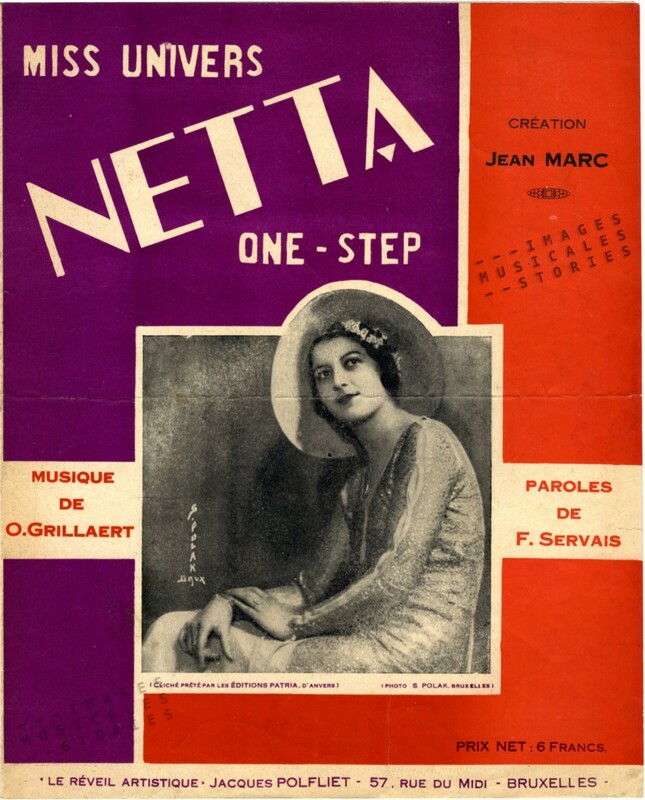 Netta by Octave Grillaert published by Le Réveil artistique, Brussels in 1931. The Netta of this song is a former Miss Belgium who became the first Belgian Miss Universe in 1931. Miss Universe titles had been awarded since 1926 during the International Pageant of Pulchritude held in Galveston, Texas. 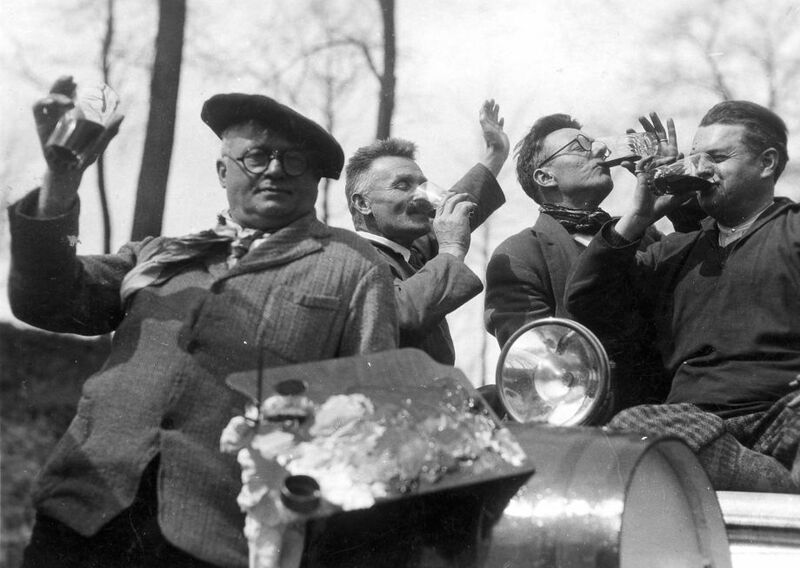 The Great Depression put an end to this yearly frivolous fuss in the United States, only to surface until after WWII. Annette (Netta) Duchâteau was a modern and daring girl who got herself a pilot license when she was only 19 years old. Even so, crossing the Atlantic in 1931 by boat to participate in the Pageant in Texas must have been quite an adventure for the young lady. 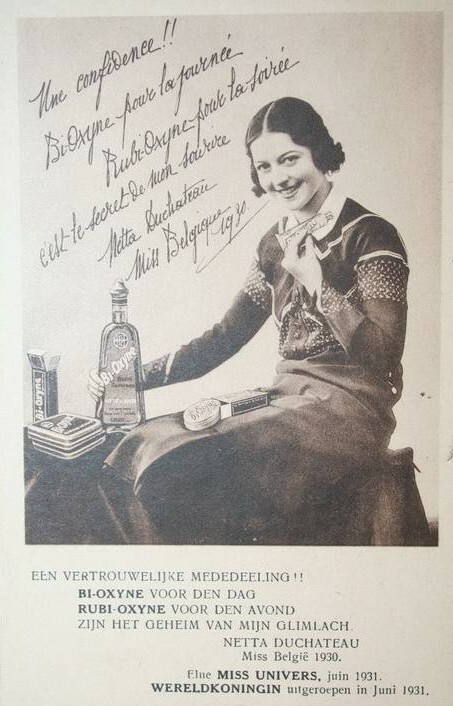 The year before, Netta had been crowned Miss Belgium. Notable members of the 1930 Belgian jury were the Flemish writer Stijn Streuvels (Frank Lateur indeed) and the painter Albert Saverys. Miss Belgium jury members Stijn Streuvels and Albert Saverys, the two men in the middle of this drinking group (source: http://www.saverys2014.be/albert-saverys). Here we see a short celebration of Netta having won her title, on the tune of the Brabançonne. Thanks to an interesting short documentary about the 1929 Austrian Miss Universe, we can visualise the circumstances to which the contestants had to adapt. Like all other contenders, Netta had to be chaperoned (in her case by her mother). She needed a medical certificate to ensure that she could endure standing still on a cart pushed around between the masses for hours, four days on end during the street parades. The candidates could not go out alone without written permission of the committee. They had to swear that they were not artists, did not indulge in drinking nor smoking. They were not allowed to use any kind of make-up. Moreover for Netta the alienation must have been particularly hard: she didn’t speak English. After her victory, Netta turned down all American marriage proposals. She also refused offers to appear on stage or in commercials, and returned to her native Belgium. There she was welcomed like royalty and again received a lot of marriage proposals. Her success was enormous compared to Anny Duny, our first Miss Belgium. She appeared in countless magazines and advertising campaigns before becoming a stage actress. Netta Duchateau praising toothpaste and mouthwash in an advertisement for Bi-oxyne and Rubi-oxyne. Allegedly Netta inspired the American illustrator Lawrence Sterne Stevens when he created the emblem for Belga, a former Belgian cigarette brand that was launched in 1923. The brands name and national colours appealed to the patriotic feelings after the Great War. Sterne Stevens drew a typical modern girl, a flapper with bobbed hair and a cloche hat. In contrast to the earlier Belga Girl by Leo Marfurt, she looks more self-reliant. She is glamorous, accentuates her looks with make-up, and expresses a certain sensuality. And she smokes! Even René Magritte created designs for the Belga cigarettes. He didn’t need a beauty queen for a model though, he had his beautiful wife Georgette. He painted her looking straight at the viewer, holding a cigarette before his familiar blue sky with white clouds. Although Magritte referred to his work in publicity as ‘idiotic work’, this design blurs the boundary between painting and advertising. The second advertising image for Belga cigarettes is signed Studio Dongo. This was a small advertising company he owned together with his brother Paul who was also a composer. Both Magritte’s projects for Belga were rejected. 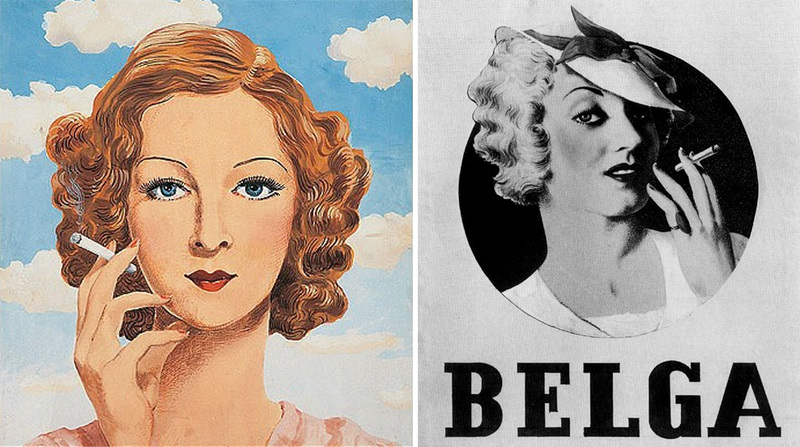 Left: Advertising project for Belga cigarettes by René Magritte. RIght: Poster design for Belga cigarettes by Studio Dongo. Thanks to Netta’s victory in Galveston the next Miss Universe pageant was held in Spa, Belgium. It was won by a Turkish beauty. At the end of the video, we get a glimpse of Maurice de Waleffe, the omnipresent gentleman when beauty contests had to be organised. He is recognisable by his telltale moustache. De fraaie afbeelding gelijk opgeslagen.